The sight of a military truck on a funeral mission on Friday October 13, sent hundreds of villagers in Bafia Muyuka fleeing for fear of arrest. When the truck showed up at the entrance into the village, the youth took to their heels and scampered for safety into nearby bushes. 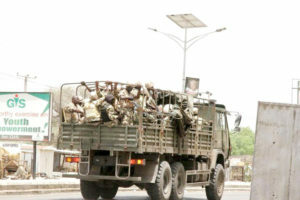 The villagers had supposedly thought the military had come for a raid as this has been the recurrent phenomenon in recent times, in the Anglophone regions. While the youth ran into hiding, a few others mustered the courage to standstill and watch the military vehicle from afar. It later dawned on them that the vehicle was transporting a corpse on mission. While some laughed at the misconception, others said it was better they ran for nothing than to fall into the dragnet of the security. The incident adds up to that of scores of youths in the locality who have taken permanent residence in the bush. Some are said to have been living in their cocoa farms to escape any security crackdown. Investigations which The Post carried out indicated that some youths have moved their wives and kids to the farms for safety. In the heat of the general fear that has enveloped the village, rumours of a list bearing names of at least 50 Bafia youths who are supposedly wanted within the scope of the Anglophone crises has worsened the situation. Pockets of village associations which crop up in the heat of the September 22 and October 1 protest have disappeared. Regular field gatherings in the village that used to see thousands in attendance have suddenly become epileptic. Apparently in preparation for the “restoration of Southern Cameroons independence” on October 1, thousands of village youths brought the locality into disarray. Signs of damage on public and private property on September 22 were worst on October 1. Sign boards of the village health centre, Government schools and others, bearing inscriptions on Cameroon were shattered, while printers and other electronic devices in the lone village secondary school were looted. On the eve of October I, persons spotted putting on dresses bearing the colours of the national flag such as the jersey of the indomitable lions were severely trashed. Ducks, fowls and other domestic animals were reportedly snatched from their owners and a feast ensued. Marijuana commonly known as ‘banga’ iced the ‘independence’ day preparation. Emmanuel Tarh, one of those shot dead on October 1 cross fire, was laid to rest on Wednesday October 11. Unlike others in the urban setting that recorded the presence of outlawed consortium president Felix Argbor Nkongho, Tarh’s was a village affair. It was only the village Chief who graced the occasion calling for restraint.